This serum is meant to be applied after toner / lotion / SK-II's Facial Treatment Essence. It's meant to reduce the appearance of fine lines and improve skin's texture in as quickly as two weeks. With its unique blend of concentrated Pitera (SK-II's miracle ingredient) which also acts as a moisture magnet to help leave skin plump, moisturised and velvety smooth. It doesn't seem much but this really works wonders for me! Way back (a good 5 years ago, maybe more) I was introduced to SK-II by Mum who likes using their products very much. Sadly, the Facial Treatment Essence a.k.a Miracle Water broke me out and I stopped using the entire range completely… Bar this product. I don't think I've ever mentioned this but I always had a bottle of this concentrate (that's what I think the 'C' in the Repair C stands for) sitting on my dresser as I reach out for it during those really dry winter days when I feel my skin could really do with an extra film of moisture. Never reviewed it either as I did not use it consistently enough to notice much of a difference other than it soothing my sore, parched cheeks. Today, I find SK-II's products work a treat on my skin and I have been receiving compliments from close friends and even random strangers! Only one pump of product is needed for me although the SK-II beauty consultant thinks you need two – one for the face and one for the neck. I am stingy and I think one pump gives more than enough product for me to go all round! Repair C comes out as clear, nearly odourless (well with a smidge of Pitera's signature scent) with a viscous texture. When you first spread it over your face it may feel a little sticky but give it a minute and it dries to a velvety, slightly powdery finish. If you feel uncomfortable with the stickiness of the product I suggest you spread it out and then gently pat your face. I find this seems to take the tacky feeling away a lot faster! The bottle shown above is a 30ml empty (I've used a bottle up!) and I've been going through Mum's deluxe-sized samples (15ml each) at the moment. I think this product makes a huge difference to my skin in terms of texture. I suffer from dry patches on my cheeks and an oil slick for a T-zone. Using this together with the other SK-II products have really helped boost my cheek's moisture levels and balanced the oiliness on my T-zone. My skin's a lot less oily now (I sure hope age isn't catching up on me) and there's a little glow about my complexion that makes me quite happy! This product makes a difference to your skin. How do you know, you wonder? Well…. I went on holiday for a good two weeks and I didn't pack Repair C with me. I wouldn't say my skin looked horrid without it but it lacked the suppleness Repair C gives me. 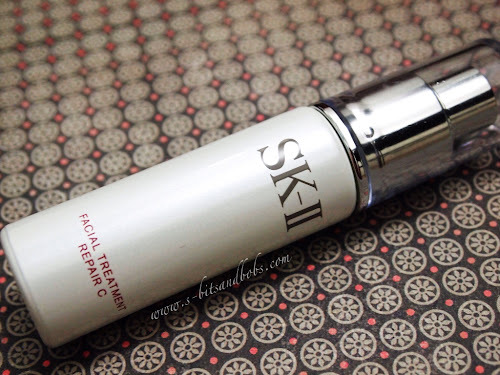 If you ever want to try something from SK-II please ask for a sample of this as I really enjoy using this and I can't imagine being without this nifty little serum for a while…. Until the next best serum comes along. There's been a lot of hype going round SK-II products where some people believe your skin develops a kind of dependency for their products and if you stop using it your skin becomes sallow / bad but I don't know if that's true! Also, many complain the Facial Treatment Essence (mainly) breaks them out. It did for me, back then but it's working really well for me now! I have a silly little theory to share but please don't judge me or take my word for it! My guess as to why my skin couldn't tolerate SK-II 5 years back is because my skin was still “young”. Fast forward half a decade later…. Skin actually loves SK-II and laps it all up! Lastly, the winner of my Giveaway #1 did not respond to the post so I had to pick another one! Congratulations, Mariann!! =) Again, if I do not hear from the winner within the next 48 hours another winner will be picked!! Previous Post Monthly update and giveaway announcement! Next Post Late Giveaway Winner Annoucement!! I am still weary of SKII. Broke me out like crazy, and my skin is 10 years older than yours. LOL! hi, just want to share a bit. I’ve an acne-prone skin as well. I’m in my late 20s now. I had very bad breakouts that lasted for months starting last summer. I was desperate, and after experimenting with different brands, I decided to turn back to SK-II. This time I bought the full regime (sob.. sob.. broke my heart when I had to pay). The consultant suggested that I use thin cotton pads to apply the essence and let it absorbed into the skin, like mini masks. As Sukie said, it did sting a bit when applied to acnes/pimples/papules/pustules (whatever they are called). In my case, the stinging sensation faded after less than a minute. I usually had 3-4 pads on my face 3x a week. Even everyday in the beginning. Now I don’t do that routine anymore because the acnes never come back, except a few small dots every month before my period. I’m on my second 330 ml bottle now. Bought them from sasa.com, the cheapest I could find online. I still keep my benzoyl peroxide 2.5% with me just in case of emergency (important meetings, dates, etc). But I haven’t used it for months now. Now m using foam sk2 then facial treatment clear lotion then facial treatment essence then essential power essence then stem power but I want use facial treatment repair c how to use ? Can be use the last after stem power?